Beauty is in the eye of the beholder, and judging design appeal is no exception. Given the contentious nature of architectural discourse in Chicago, we've tapped into the knowledge base of Garrett Karp, Chicago Open House Program Manager, who essentially oversees the Chicago Architecture Foundation's big annual event as the building curator and program designer. He's a historical expert, well-versed in the city's significant spaces -- from new Downtown high-rises to rocket ship-style churches to hidden-in-plain-sight war memorials -- and these are his picks for the city's most beautiful buildings. The former home of the Union Carbide and Carbon Company, which developed the first dry-cell battery, is one of Chicago's stand-out Art Deco works. Designed by Daniel Burnham's sons, Daniel Jr. and Hubert, its distinct, narrow tower of polished black granite and dark green terra cotta tapers to a lavish 24k gold leaf and bronze trimmed spire -- much like a Champagne bottle capped with foil. Its restored interior also makes a statement with an extravagant hotel lobby of frosted glass fixtures and Belgian marble. Karp loves it because: "I don't think there's many lists on Chicago architecture that've left this one off. It differs from other Art Deco skyscrapers in Chicago because of its shape and really distinct, striking colors and all of the gold trim up at the top. Almost all of the Art Deco high-rises you see are kind of the same really drab, boring beige limestone." Thought to be inspired by a Persian incense burner, which architect John Eberson discovered in an antique store, the enormous atmospheric theater once transported moviegoers to a far-off land. 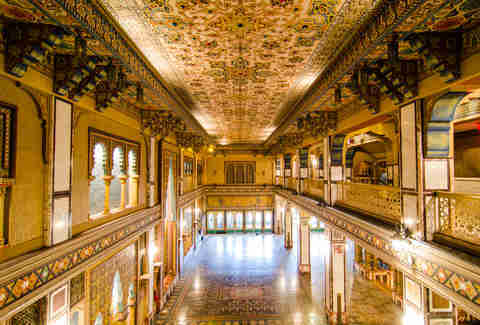 Closed for most of the last decade, the 2,500-seat Moorish Revival palace entertained audiences years before television began captivating the masses. Its exotic lobby features colored tile under a flying-carpet ceiling, set with glistening gemstones, and an auditorium mimics an outdoor bazaar at night with tented stage and twinkling lights as stars. An exterior mural remains a salute to jazz and blues musicians like Louis Armstrong and Duke Ellington. Karp loves it because: "It's one of the few original movie palaces remaining in Chicago. It has an atmospheric auditorium a lot like the Aragon Ballroom or the Music Box Theatre, but I think my favorite thing is that it's a Middle Eastern or Persian design with incredible artwork on the interior. People are curious about the building because they see it from the Skyway and it's kind of an odd location for a large movie palace, and really one of the only chances people get to see it now is through Open House Chicago." Daniel Burnham's flagship Beaux Arts-style building on Michigan Ave commands attention for many reasons. Originally constructed for Santa Fe and other railroad corporations, the historic commercial office building now houses the Chicago Architecture Foundation and renowned architecture firms. Upon completion, Burnham's firm immediately moved into a small penthouse, where they laid the foundation for the 1909 Plan of Chicago. Its glazed white terra cotta facade with circular porthole windows lining the top floor are a throwback to the World's Columbian Exposition. Today, visitors can walk into its breathtaking, light- and air-filled glass atrium with a grand staircase. Karp loves it because: "Before I ever worked here, I used to walk into the atrium of this building and get goosebumps. I think it's just one of the coolest buildings in the city and it has a great story. 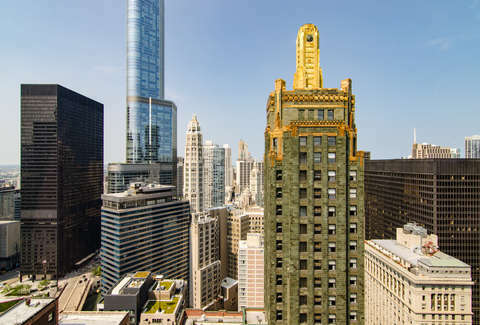 The building was completed in 1904, but the story is that Daniel Burnham constructed a penthouse on the northeast corner of the roof, which is where he and a lot of his team designed the comprehensive plan of Chicago, which was published in 1909. 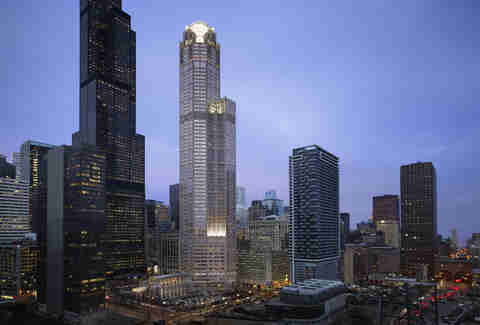 So Burnham designed the building, and then it's where he oversaw the plans for the entire city of Chicago." 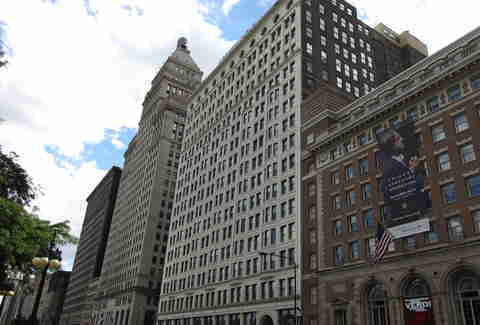 The architectural masterpiece originally designed by Burnham & Root in 1888 is one of the most-recognized buildings in the city. Frank Lloyd Wright later re-envisioned its two-story mezzanine with an oriel staircase and glass ceiling to illuminate white marble with gold geometric patterning, which now covers darker, copper-plated ironwork. The commercial office's facade experiments with late Roman, Venetian, Moorish, and medieval-European elements. Karp loves it because: "When they decided to renovate the lobby, they brought in Frank Lloyd Wright. The original John Root design was very dark in color on the outside, and inside was very similar with dark, cast iron work. Wright's renovation is the complete opposite in style from the original. The atrium now is the way that Wright envisioned it; it's very bright with a lot of white marble and also gold leaf ornamentation. 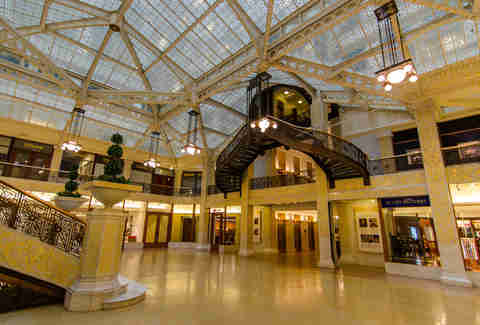 So it's not the original atrium, but it's now over 110 years old, and one of the most stunning spaces in the city." The building's reddish-brown masonry facade blends in with its neighbors, but the tower with its distinctive green gabled roof -- a nod to Burnham & Root's demolished 1892 Masonic Temple -- definitely makes a skyline statement. Its Postmodern characteristics of over-the-top symbolism and bold colors are a direct response to a fundamentally rigid International Style. 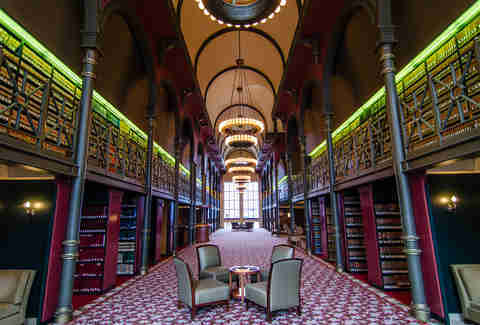 An opulent lobby gives way to a 55ft-high gold leaf ceiling and the Harry Potter-esque law library offers superb Downtown views from the 40th floor. Karp loves it because: "It depends on who you talk to, but a lot of architecture nerds don't really like skyscrapers or really any buildings from the Postmodern era, which is late '80s through maybe late '90s. In Chicago, I think we have some of the best examples of Postmodern architecture, and some of them are kind of ugly, but some of them I really like. It's a 40-story skyscraper, but it's designed to look like a chateau. It has this huge gabled roof with green shingles. It looks like something that's designed more for the medieval times than the 1980s." The octagonal, pink granite skyscraper beside Willis Tower is one of the most visible buildings in the skyline at night due to its Tribune Tower-inspired crown. Illuminated white (it changes colors for holidays and special events) by 1,852 fluorescent tubes, the top is comprised of five glass cylinders, an arrangement resembling engagement ring diamonds. The two-level lobby/winter garden has a glass ceiling supported by "L" track-influenced steel structures, designed for a possible connection via underground passageway to Union Station. Karp loves it because: "I just think it's kind of a wacky, loud building in the grand scheme of things. It has pink marble, it's octagonal shaped, and it has these strange setbacks on the lower level. We don't have any other skyscrapers of that color. People can typically go into the first floor lobby. It has one of the coolest public atriums in the entire city -- an incredible space with fountains and marble." One of the most popular Open House Chicago sites is a magnificent war memorial at the edge of Lincoln Park. Designed for an American Institute of Architects competition to honor the 1,000+ Order of Elks members who fell in WWI, the winning blueprints left us one of the grandest spaces in the city. 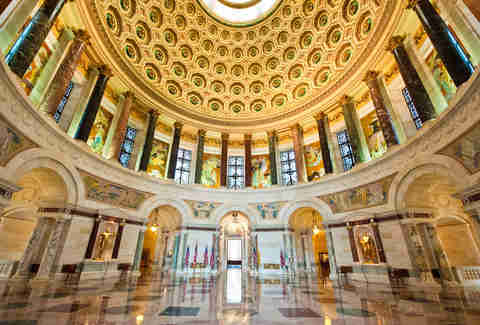 Life-sized bronze elks are the sole outward clue to the interior's stunning domed rotunda, opulent reception hall, monumental statuary, and colored marbles from all over the world. Over the years, the national headquarters of the Benevolent and Protective Order of Elks has been re-dedicated several times to remember the Elks who died in all wars. Karp loves it because: "At the end of Diversey Parkway at Lincoln Park, there's a huge domed memorial building. It's been one of our most popular sites with Open House Chicago the past few years, but I don't think most people know that it's there, and it's one of the most incredible buildings in the US. It's sometimes open to the public, but it is seriously the most stunning interior space in Chicago. It has a giant rotunda on the inside that I think makes the Capitol Building in DC seem kind of boring in comparison." The seven-story Richardsonian-Romanesque building in Englewood is one of Chicago's best-kept secrets. The landmark luxury apartment building originally hosted visitors of the World's Columbian Exposition of 1893, and it was saved and extensively restored as apartments for seniors in 2003. 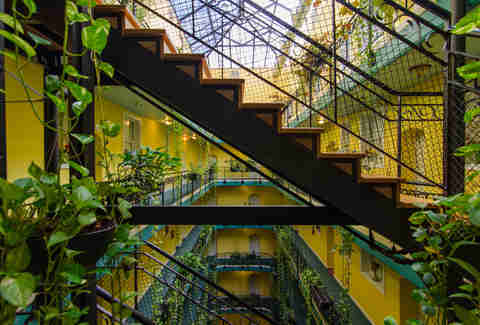 Its trickling fountains and lush skylit atrium encompassed by vine-covered walkways resembling balconies in New Orleans French Quarter offer respite from the city streets. Karp loves it because: "Some of the best architecture is definitely south. This historic apartment building is a totally unexpected space that was almost demolished about 15 years ago, and this was the very first year that we included it in Open House Chicago. I think a lot of people were just really excited to learn that there's a building like that in Englewood. There were probably three buildings like it in Chicago, but The Yale isn't on most people's radar. It has this beautiful atrium space with catwalk balconies around it and hanging plants." One of Chicago's most architecturally distinctive Catholic churches is just down the street from the Yale Building. While most Catholic churches in the city were built by and for European immigrants, St. Benedict was conceptualized for its predominantly African American community after five South Side parishes consolidated in the 1980s. The round, skylit Modernist church, inspired by the form of traditional African huts, sustains lush vegetation and holds one of the nation's largest baptismal pools. Karp loves it because: "Almost all Catholic churches in the Chicago area were designed by and for European immigrants, so you kind of see the same style over and over again. 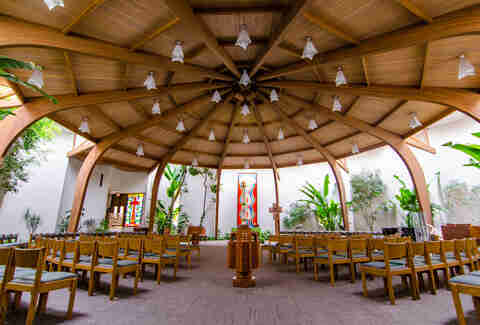 This one is a modernist, circular church designed to look like you're in a tribal village outdoors at night. So there's a bunch of foliage, really cool wood carvings, and it's sky lit, so it's just completely different than any other church in the city. It even has pictures of Chicago skyscrapers in the modern stained glass." 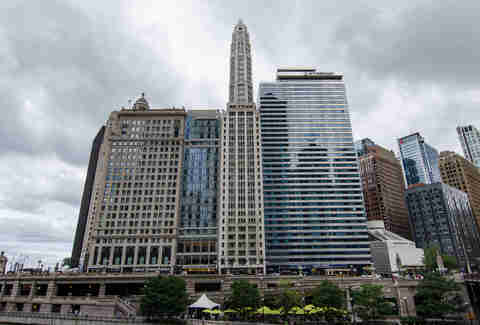 At its completion in 1928, the Neo-gothic tower was briefly Chicago's tallest building. It remains the city's most slender high-rise with a base of 100 by 65ft and top floor of only 280sqft thanks to a zoning ordinance in 1923. The unconventionally designed terra cotta-clad skyscraper, sometimes called "The Inverted Spyglass," consists of a 21-story octagonal tower atop a more traditional 20-story rectangular box. After pieces of terra cotta fell off the tower, the cupola at the top was demolished in 2000, and a new one was airlifted to restore it two years later. Karp loves it because: "Proportionally speaking, it's one of the absolute narrowest towers in the world with one room per floor at the top, and I think that's incredibly neat. When it was originally completed, it was the tallest building in Chicago for a matter of days before the Chicago Board of Trade Building was completed." The 72-story, sleek glass skyscraper, which reflects the sky, rises from the heart of a block of historic, low-rise buildings. Literally plugged into its Jeweler's Row Historic District neighbors by foundational supports, the unimposing residential tower even preserves the historic masonry and terra cotta facades along Wabash Ave to interact seamlessly with its landmark community at street level. It shares space with the School of the Art Institute of Chicago, connects tenants to the century-old University Club via a sky-bridge, and its narrow design maximizes views of Lake Michigan and Millennium Park. Karp loves it because: "There's a lot of new, sleek glass and steel skyscrapers in the Loop, but I think this is my favorite contemporary skyscraper of all the new ones. 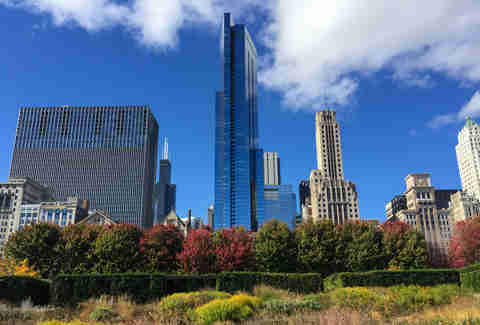 It has an interesting design that references other buildings in the city and it looks really stunning from Grant Park. One of Solomon Cordwell Buenz's calling cards, especially in the firm's earlier years, were a lot of buildings with rounded corners and curves, and this building is the exact opposite of that. It's very angular and straight, so I think it's kind of fun that they mixed up their normal formula for that building. The Legacy will be a cool building for years down the road. Unlike some of the other newer skyscrapers, it won't look like the product of the year it was built." An out-of-this-world church exists close to O'Hare and is "easily one of the most unique churches in Chicago, and not a whole lot of people know about it," says Karp. 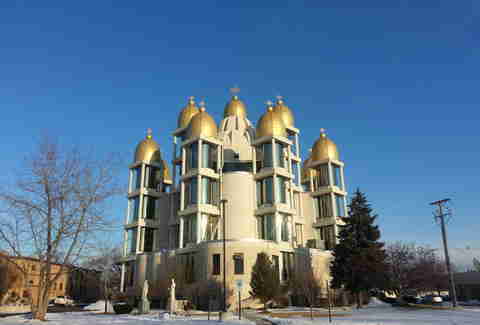 The rocketship Cumberland Ave church is comprised of 13 towers with gold domes, symbolizing the 12 apostles and Jesus Christ as the largest center dome. It's a blend of modern and traditional Eastern European styles with concrete, steel, and glass as well as ornate, symbolic elements. Its Byzantine icon-adorned interior is flooded with light since the building is 75% glass. Karp loves it because: "It's strange. It looks like an alien spaceship. It's easily one of the most unique churches in Chicago, and not a whole lot of people know about it because it's just so far outside of downtown." Nicole Bruce is a contributing writer for Thrillist. She finds all weird things, even wacky churches, beautiful. Find her on Twitter at @nicoleabruce.